Association between Urinary Sodium Excretion and Bone Health in Male and Female Adults. High salt intake is a well-known risk factor for osteoporosis, but the association between bone mass and urinary sodium excretion has not been studied as yet. This study investigates the hypothesis that urinary sodium excretion is negatively associated with bone mass and the risk of osteoporosis. This cross-sectional study was performed using data from the Korea National Health and Nutrition Examination Survey, 2008-2011. Participants (n = 16,279) were divided into age groups; men were categorized as younger than 50 years of age or 50 years or greater, women were categorized as pre- or post-menopausal. Multivariate linear regression analysis showed that urinary sodium excretion was negatively associated with bone mineral content (BMC) and bone mineral density (BMD) in premenopausal and postmenopausal women. Sodium excretion was negatively associated with BMC and BMD of the lumbar spine in women with normal bone health, osteopenia and osteoporosis, but there was no association in men. Increased sodium excretion was significantly associated with risk for osteoporosis/osteopenia in premenopausal women. This study demonstrates that urinary sodium excretion is negatively associated with bone health, suggesting that high salt intake could be a possible risk factor for osteoporosis in Korean women, but not in men. Invited review: Dairy intake and bone health: a viewpoint from the state of the art. The aim of this review was to focus on the complex relationships between milk and dairy products intake and bone health, with particular emphasis on osteoporosis. The literature was extensively examined to provide an objective overview of the most significant achievements on the subject. Osteoporosis can be defined as a disease characterized by low bone mass and microarchitectural deterioration of bone tissue, leading to enhanced bone fragility and a consequent increase in fracture risk. Although the major determinants of peak bone mass and strength are genetic, major factors during childhood and adolescence may affect the ability to achieve peak bone mass. These include nutrition, particularly calcium and protein intake, physical activity, endocrine status, as well as exposure to a wide variety of risk factors. The role of calcium intake in determining bone mineral mass is well recognized to be the most critical nutritional factor to achieve optimal peak bone mass. The greatest amount of dietary calcium is obtained from milk and dairy foods, which also provide the human diet with vitamin D (particularly for products fortified with vitamin D), potassium, and other macro- and micronutrients. Although studies supporting the beneficial effects of milk or calcium on bone health are predominant in the literature, perplexity or discordance on this subject was expressed by some authors. Discordant data, mainly on the risk of fractures, provided limited proof of the unfavorable effect of dairy intake. More often, discordant works indicate no effect of dairy consumption on bone safety. Some considerations can be drawn from this viewpoint. Milk and dairy products are an optimal source of calcium as well as of other limiting nutrients (e.g., potassium and magnesium), with important effects on bone health. Bioactive components occurring in milk and dairy products may play an essential role on bone metabolism, as shown by in vivo and in vitro studies on colostrum acidic proteins and milk basic proteins. Calcium intake positively affects bone mass and is crucial in childhood and youth for correct bone development. In elderly people, calcium intake as well as vitamin D availability should be carefully checked. As a general conclusion, calcium is essential for bone health, although it will not prevent bone loss due to other factors; in this context, milk and dairy foods are bioavailable, relatively inexpensive sources of calcium for the human diet. This study examined whether higher intakes of milk and other calcium-rich foods during adult years can reduce the risk of osteoporotic fractures. This was a 12-year prospective study among 77761 women, aged 34 through 59 years in 1980, who had never used calcium supplements. Dietary intake was assessed with a food-frequency questionnaire in 1980, 1984, and 1986. Fractures of the proximal femur (n = 133) and distal radius (n = 1046) from low or moderate trauma were self-reported on biennial questionnaires. We found no evidence that higher intakes of milk or calcium from food sources reduce fracture incidence. Women who drank two or more glasses of milk per day had relative risks of 1.45 for hip fracture (95% confidence interval [CI] = 0.87, 2.43) and 1.05 for forearm fracture (95% CI = 0.88, 1.25) when compared with women consuming one glass or less per week. Likewise, higher intakes of total dietary calcium or calcium from dairy foods were not associated with decreased risk of hip or forearm fracture. These data do not support the hypothesis that higher consumption of milk or other food sources of calcium by adult women protects against hip or forearm fractures. Dietary calcium intake and mortality risk from cardiovascular disease and all causes: a meta-analysis of prospective cohort studies. Considerable controversy exists regarding the association between dietary calcium intake and risk of mortality from cardiovascular disease and all causes. Therefore, we performed a meta-analysis of prospective cohort studies to examine the controversy. We identified relevant studies by searching MEDLINE, Embase, and the Cochrane Library databases between 1 September 2013 and 30 December 2013. Reference lists of relevant articles were also reviewed. Observational prospective studies that reported relative risks and 95% confidence intervals for the association of calcium intake with cardiovascular and all-cause mortality were eligible. Study-specific relative risks were pooled using a random-effects model. In this meta-analysis, 11 prospective studies with 12 independent cohorts, involving 757,304 participants, were eligible. There was evidence of a non-linear association between dietary calcium intake and risk of mortality from cardiovascular disease (P for non-linearity <0.01) and all causes (P for non-linearity <0.01). A dose-response analysis showed a U-shaped relationship between dietary calcium intake and cardiovascular mortality. Intakes that were lower and higher than around 800 mg/day were gradually associated with a higher risk of cardiovascular mortality. For all-cause mortality, we also observed a threshold effect at intakes around 900 mg/day. The risk of all-cause mortality did not decrease further at intakes above 900 mg/day. 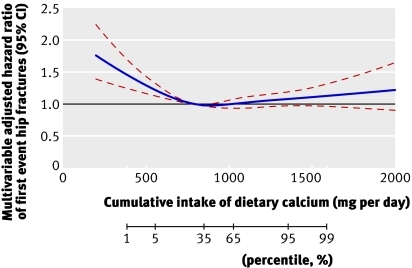 This meta-analysis of prospective cohort studies suggests that dietary calcium intake is associated with cardiovascular mortality in a U-shaped manner and that high dietary calcium intake (>900 mg/day) is not associated with a decreased risk of all-cause mortality. Calcium intake and fracture risk: results from the study of osteoporotic fractures. The relation between dietary calcium, calcium, and vitamin D supplements and the risk of fractures of the hip (n = 332), ankle (n = 210), proximal humerus (n = 241), wrist (n = 467), and vertebrae (n = 389) was investigated in a cohort study involving 9,704 US white women aged 65 years or older. Baseline assessments took place in 1986-1988 in four US metropolitan areas. Dietary calcium intake was assessed at baseline with a validated food frequency questionnaire. Data on new nonvertebral fractures were collected every 4 months during a mean of 6.6 years of follow-up; identification of new vertebral fractures was based on comparison of baseline and follow-up radiographs of the spine done a mean of 3.7 years apart. Results were adjusted for numerous potential confounders, including weight, physical activity, estrogen use, protein intake, and history of falls, osteoporosis, and fractures. There were no important associations between dietary calcium intake and the risk of any of the fractures studied. Current use of calcium supplements was associated with increased risk of hip (relative risk = 1.5, 95% confidence interval 1.1-2.0) and vertebral (relative risk = 1.4, 95% confidence interval 1.1-1.9) fractures; current use of Tums antacid tablets was associated with increased risk of fractures of the proximal humerus (relative risk = 1.7, 95% confidence interval 1.3-2.4). There was no evidence of a protective effect of vitamin D supplements. Although a true adverse effect of calcium supplements on fracture risk cannot be ruled out, it is more likely that our findings are due to inadequately controlled confounding by indications for use of supplements. In conclusion, this study did not find a substantial beneficial effect of calcium on fracture risk. Dietary calcium intake and risk of fracture and osteoporosis: prospective longitudinal cohort study. To investigate associations between long term dietary intake of calcium and risk of fracture of any type, hip fractures, and osteoporosis. A longitudinal and prospective cohort study, based on the Swedish Mammography Cohort, including a subcohort, the Swedish Mammography Cohort Clinical. A population based cohort in Sweden established in 1987. 61,433 women (born between 1914 and 1948) were followed up for 19 years. 5022 of these women participated in the subcohort. Primary outcome measures were incident fractures of any type and hip fractures, which were identified from registry data. Secondary outcome was osteoporosis diagnosed by dual energy x ray absorptiometry in the subcohort. Diet was assessed by repeated food frequency questionnaires. During follow-up, 14,738 women (24%) experienced a first fracture of any type and among them 3871 (6%) a first hip fracture. Of the 5022 women in the subcohort, 1012 (20%) were measured as osteoporotic. 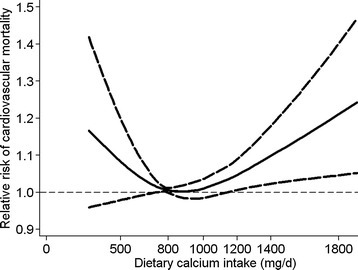 The risk patterns with dietary calcium were non-linear. The crude rate of a first fracture of any type was 17.2/1000 person years at risk in the lowest quintile of calcium intake, and 14.0/1000 person years at risk in the third quintile, corresponding to a multivariable adjusted hazard ratio of 1.18 (95% confidence interval 1.12 to 1.25). The hazard ratio for a first hip fracture was 1.29 (1.17 to 1.43) and the odds ratio for osteoporosis was 1.47 (1.09 to 2.00). With a low vitamin D intake, the rate of fracture in the first calcium quintile was more pronounced. The highest quintile of calcium intake did not further reduce the risk of fractures of any type, or of osteoporosis, but was associated with a higher rate of hip fracture, hazard ratio 1.19 (1.06 to 1.32). 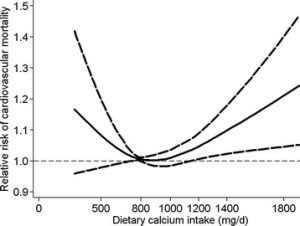 Gradual increases in dietary calcium intake above the first quintile in our female population were not associated with further reductions in fracture risk or osteoporosis. Effect of calcium supplementation on hip fractures. There have been numerous studies of the effects of calcium supplementation, with or without vitamin D, on fractures. Individually, they have not provided clarity regarding calcium’s anti-fracture efficacy, though they have established that calcium does have beneficial effects on bone density throughout the skeleton in women. Meta-analysis of these data suggests that total fracture numbers are diminished. However, the data from the 5,500 women involved in trials of calcium monotherapy show consistent adverse trends in numbers of hip fractures (relative risk 1.50, 95% CI 1.06-2.12). Observational data from the Study of Osteoporotic Fractures show a similar increase in risk of hip fracture associated with calcium use. We hypothesize that reduced periosteal expansion in women using calcium supplementation might account for the differences in anti-fracture efficacy of calcium at the hip, in comparison with other sites. Until there are further trial results to clarify this area, the present findings suggest that reliance on high calcium intakes to reduce the risk of hip fracture in older women is not appropriate. In addition, those at risk should be looking to other agents with a proven capacity to prevent hip fractures, such as bisphosphonates. Furthermore, our own recent trial of calcium monotherapy suggested that there might be heterogeneity between the responses of hip and other fractures to calcium supplementation , with downward trends in vertebral, forearm, and total osteoporotic fractures, but a significant increase in hip fractures. Observational studies have also assessed the relationship between calcium use and fractures. While there is a potential problem of confounding by indication, it is noteworthy that the Study of Osteoporotic Fractures reported an increase in hip fracture risk in postmenopausal women taking calcium supplements of almost identical magnitude to that found in the present meta-analysis (relative risk 1.5; 95%CI, 1.1–2.0) . This consistency across the available intervention studies and a large observational study raises doubts regarding the safety of calcium monotherapy in elderly postmenopausal women, though we cannot completely preclude the possibility that these results are a chance finding arising from the smaller numbers of this particular fracture type. The adverse effect of calcium monotherapy on hip fractures poses the question of how this could occur when the same intervention has the opposite effect on total fracture numbers. Biological and therapeutic effects of ortho-silicic acid and some ortho-silicic acid-releasing compounds: New perspectives for therapy. Silicon (Si) is the most abundant element present in the Earth’s crust besides oxygen. However, the exact biological roles of silicon remain unknown. Moreover, the ortho-silicic acid (H4SiO4), as a major form of bioavailable silicon for both humans and animals, has not been given adequate attention so far. Silicon has already been associated with bone mineralization, collagen synthesis, skin, hair and nails health atherosclerosis, Alzheimer disease, immune system enhancement, and with some other disorders or pharmacological effects. Beside the ortho-silicic acid and its stabilized formulations such as choline chloride-stabilized ortho-silicic acid and sodium or potassium silicates (e.g. M2SiO3; M= Na,K), the most important sources that release ortho-silicic acid as a bioavailable form of silicon are: colloidal silicic acid (hydrated silica gel), silica gel (amorphous silicon dioxide), and zeolites. Although all these compounds are characterized by substantial water insolubility, they release small, but significant, equilibrium concentration of ortho-silicic acid (H4SiO4) in contact with water and physiological fluids. Even though certain pharmacological effects of these compounds might be attributed to specific structural characteristics that result in profound adsorption and absorption properties, they all exhibit similar pharmacological profiles readily comparable to ortho-silicic acid effects. The most unusual ortho-silicic acid-releasing agents are certain types of zeolites, a class of aluminosilicates with well described ion(cation)-exchange properties. Numerous biological activities of some types of zeolites documented so far might probably be attributable to the ortho-silicic acid-releasing property. In this review, we therefore discuss biological and potential therapeutic effects of ortho-silicic acid and ortho-silicic acid -releasing silicon compounds as its major natural sources. …Interestingly, the administration of silicon in a controlled clinical study induced a significant increase in femoral bone mineral density in osteoporotic women . Direct relationship between silicon content and bone formation has been shown by Moukarzel et al. . They found a correlation between decreased silicon concentrations in total parenterally fed infants with a decreased bone mineral content. This was the first observation of a possible dietary deficiency of silicon in humans. A randomized controlled animal study on aged ovariectomized rats revealed that long-term preventive treatment with ch-OSA prevented partial femoral bone loss and had a positive effect on the bone turnover . Dietary silicon is associated with postmenopausal bone turnover and bone mineral density at the women’s age when the risk of osteoporosis increases. Moreover, in a cohort study on 3198 middle-aged woman (50–62 years) it was shown that silicon interacts with the oestrogen status on bone mineral density, suggesting that oestrogen status is important for the silicon metabolism in bone health . Dietary silicon intake is positively associated with bone mineral density in men and premenopausal women of the Framingham Offspring cohort. The role of dietary silicon in bone health in humans is not known. In a cross-sectional, population-based study (2847 participants), associations between dietary silicon intake and BMD were investigated. Dietary silicon correlated positively and significantly with BMD at all hip sites in men and premenopausal women, but not in postmenopausal women, suggesting that increased silicon intake is associated with increased cortical BMD in these populations. Osteoporosis is a burgeoning health and economic issue. Agents that promote bone formation are widely sought. Animal and cellular data suggest that the orthosilicate anion (i.e., dietary silicon) is involved in bone formation. The intake of silicon (Si, approximately 30 mg/day) is among the highest for trace elements in humans, but its contribution to bone health is not known. In a cross-sectional, population-based study, we examined the association between silicon intake and bone mineral density (BMD) in 1251 men and 1596 pre- and postmenopausal women in the Framingham Offspring cohort (age, 30-87 years) at four hip sites and lumbar spine, adjusting for all potential confounding factors known to influence BMD and nutrient intake. Silicon intake correlated positively with adjusted BMD at four hip sites in men and premenopausal women, but not in postmenopausal women. No significant association was observed at the lumbar spine in any group. Categorical analysis by Si intake, or energy-adjusted Si intake, supported these findings, and showed large differences in BMD (up to 10%) between the highest (> 40 mg Si/day) and lowest (< 14 mg Si/day) quintiles of silicon intake. A significant association at the lumbar spine in men was also observed. Further analyses indicated that some of the effects seen for moderate consumption of alcoholic beverages on BMD might be attributed to Si intake. These findings suggest that higher dietary silicon intake in men and younger women may have salutary effects on skeletal health, especially cortical bone health, that has not been previously recognized. Confirmation of these results is being sought in a longitudinal study and by assessment of the influence of silicon intake on bone markers in this cohort. Silicon deprivation decreases collagen formation in wounds and bone, and ornithine transaminase enzyme activity in liver. We have shown that silicon (Si) deprivation decreases the collagen concentration in bone of 9-wk-old rats. Finding that Si deprivation also affects collagen at different stages in bone development, collagen-forming enzymes, or collagen deposition in other tissues would have implications that Si is important for both wound healing and bone formation. Therefore, 42 rats in experiment 1 and 24 rats in experiment 2 were fed a basal diet containing 2 or 2.6 microg Si/g, respectively, based on ground corn and casein, and supplemented with either 0 or 10 microg Si/g as sodium metasilicate. At 3 wk, the femur was removed from 18 of the 42 rats in experiment 1 for hydroxyproline analysis. A polyvinyl sponge was implanted beneath the skin of the upper back of each of the 24 remaining rats. Sixteen hours before termination and 2 wk after the sponge had been implanted, each rat was given an oral dose of 14C-proline (1.8 microCi/100 g body wt). The total amount of hydroxyproline was significantly lower in the tibia and sponges taken from Si-deficient animals than Si-supplemented rats. The disintegrations per minute of 14C-proline were significantly higher in sponge extracts from Si- deficient rats than Si-supplemented rats. Additional evidence of aberrations in proline metabolism with Si deprivation was that liver ornithine aminotransferase was significantly decreased in Si-deprived animals in experiment 2. Findings of an increased accumulation of 14C-proline and decreased total hydroxyproline in implanted sponges and decreased activity of a key enzyme in proline synthesis (liver ornithine aminotransferase) in Si-deprived animals indicates an aberration in the formation of collagen from proline in sites other than bone that is corrected by Si. This suggests that Si is a nutrient of concern in wound healing as well as bone formation.